The Pedigree Mixed Selection in Loaf Wet Adult Dog Food is a complete and delicious wet adult dog food that comes in 2 scrumptious flavours: Chicken with Carrots & Beef with Carrots - perfect for a fresh healthy meal, on its own or on top of dry dog food. 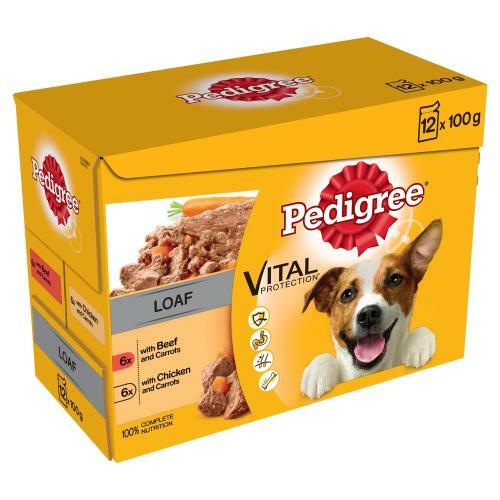 Pedigree Mixed Selection in Loaf Wet Adult Dog Food helps support healthy bones, good digestion, a healthy skin & coat and strong natural defences. Also contains no artificial colours, flavours or preservatives. Meat and Animal Derivatives (50%, including 4% Chicken), Vegetables (including 4% Carrots), Cereals, Minerals, Derivatives of Vegetable Origin (including 0.5% Dried Beet Pulp), Vegetable Protein Extracts, Oils and Fats (including 0.5% Sunflower Oil).